Posted On Mon, 05 Feb 2018 23:40:48 +0000. Filed in ramblings. By Vaibhav Bhandari. Our team was largely strangers before this weekend, but we were brought together by our shared passion for a topic that means a lot to each of us personally: mental health. Each and every one of us is affected by this topic — be it through the careers we choose, the people we love, or the experiences we live. And though none of us knew what we wanted to build when we signed up for HackMentalHealth, all of us wanted to create something that could make a difference. At the start of the hack, a few of us came together after hearing Jonathan’s pitch. Jonathan’s startup, reflect, came out of his own personal struggle of taking a long time to find the right therapist. As the conversation grew, others joined the team, excited to lend their skills. Drawing from our own experiences, we originally focused on helping clients in therapy. After meeting with several HackMentalHealth mentors, including UCSF psychiatrist Dr. Steven Chan and healthcare technologist Swatee Surve, we realized a pivotal and oft-ignored opportunity to start the conversation occurs even before a mental health practitioner is involved — in the primary care setting. This was our a-ha moment. We instantly knew that building a product to serve this setting while minimizing disruption to the care team’s existing workflow would be key to making an impact. One in five US adults lives with an adverse mental health condition, and 70% of conditions that present themselves in the primary care setting are mental health related. Unfortunately, context critical to mental health goes under-discussed as overburdened providers have just 15 minutes with each patient and thus often miss a critical opportunity to potentially diagnose and treat underlying mental health conditions. Misattributed symptoms like fatigue, sleep disorders, chronic pain, chest pain, dizziness, and abdominal discomfort often lead to unnecessary and expensive testing to find a physical cause. Because mental health tends to evade conversation, symptoms often worsen for patients dealing with undiagnosed conditions and result in exacerbated comorbidities. This downward spiral costs the healthcare system over $500 billion annually. We knew we needed to bring the conversation around mental health into the general practitioner setting if we wanted to truly make a impact. 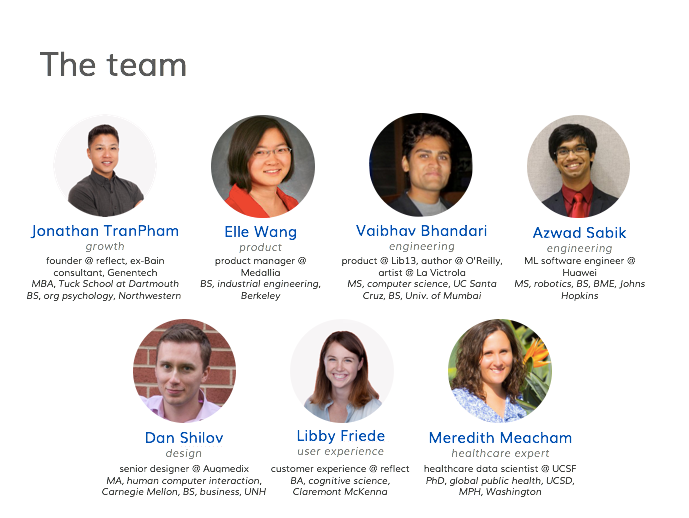 Mirror Health is a platform for primary care teams to use their limited time to assess, counsel, and treat mental health issues more effectively. Our product is a simple screening tool that patients can fill out in less than 2 minutes as they wait for their primary care appointment (the average wait time is over 19 minutes). The survey combines widely used and validated questions from the Patient Health Questionnaire (PHQ)-2 and Generalized Anxiety Disorder Scale (GADS)-2 depression and anxiety assessments, along with more open-ended questions around any significant life events or stressors (like loss of a job or relationship) they may be facing. Recognizing that self disclosure is often a barrier to information, we used empathetic design to help patients feel more comfortable sharing. We also believe technology is an asset here, encouraging patients to share facts they might otherwise feel embarrassed to do so with medical staff..
By providing greater context around the patient and what they might be facing in their lives, we help clinicians see patients’ mental health more clearly. Because a clinician’s time is limited, our platform presents this information to the primary care provider at the point of care in an intuitive and easy to read dashboard report, alerting the provider to pursue a more in-depth assessment, counseling, and referral to further treatment if needed. It’s important for us to note that Mirror Health is not a diagnostic tool. It gathers and distills data to help flag potential issues to the primary care team — it enables mental health to enter the conversation. We accomplished a lot in the short period of time. But there’s much more to be done. Are you a mental health practitioner or a primary care doctor? We would love to get your feedback on how we can make Mirror Health work for your practice. In addition to the self-reported data we currently leverage, we’re excited to explore biometric and behavioral data as predictors. This includes practical ways of assimilating Mirror Health into existing workflows and systems, such as the electronic (and paper) health record systems that doctors’ offices use today. A screening platform that works in existing workflow and addresses a need is just the beginning. Our broader future vision is to entirely redesign the waiting room experience to make patients feel safe and open to talking about their mental health in the most common healthcare setting. There is an endless future for Mirror Health — empathy robots, waiting room redesign, and an expansion of the type of targeted mental health conditions. We hope our platform can help destigmatize mental health by integrating the conversation more seamlessly into physical healthcare settings. We talk about physical health with our doctors in annual checkups; why shouldn’t we discuss mental health too? 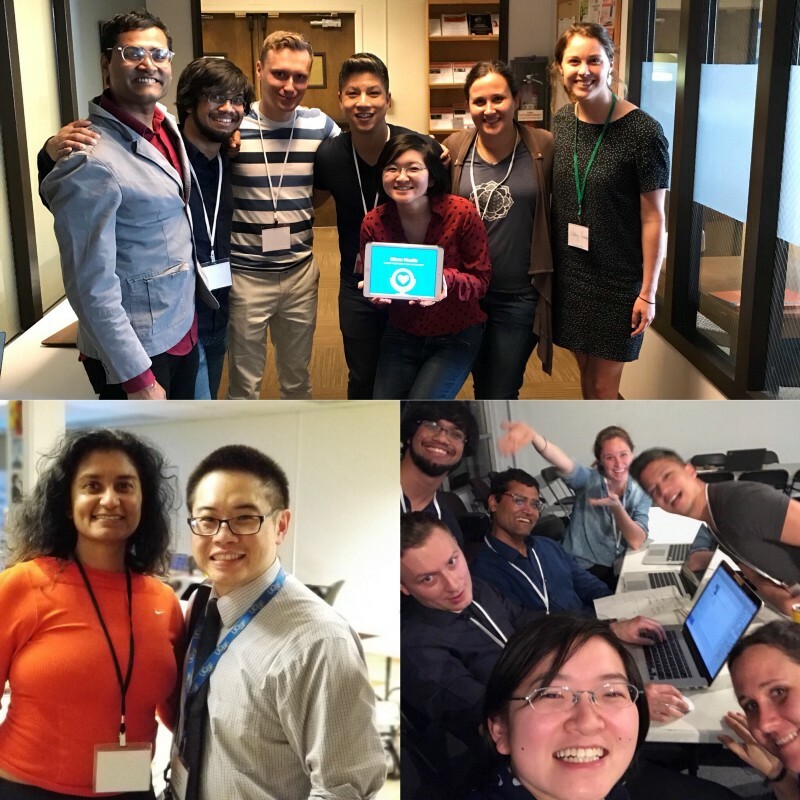 We had an amazing time at HackMentalHealth! For most of us, this was our first hackathon, and we didn’t know each other before forming a team after the initial pitch session. Hackathons have a reputation for being sleepless Red Bull-fueled stress zones and this hackathon completely flipped the script. We started as strangers and became a team through a weekend of jokes and stimulating conversation. We enjoyed the collaborative spirit from neighboring teams and friendly competition while taking care of our minds and bodies through yoga workshops and nourishing food. Building a product that can help physicians provide better care to their patients has been immensely rewarding. We all left with more awareness, confidence, and willpower to change the world. Thank you #HackMentalHealth for starting the movement. You truly set the gold standard of how a hackathon ought to be.